Provide comfort for the family of Enrico Mansueti with a meaningful gesture of sympathy. 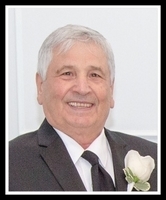 God called Enrico Mansueti home on April 7, 2019 at the age of 76. He will be forever missed by his loving wife Paola of 42 years. Cherished and adored by his children Laura and Luisa (Rocco) and sweet granddaughter Madeline. Also deeply missed by his siblings Mario (Franca), Giuseppe (Lucia), Gino and Elisa (Michele). He will be missed and never forgotten by his sister-in-laws, brother-in-laws and his many nieces and nephews both near and far. He'll be held dear in the hearts of his family, relatives and his many friends here and in Italy. Predeceased by his mother (Erminia), father (Luigi), and his sisters Plautilla and Suor Maria Chiara Domenica, nephew Luigi and father-in-law Giuseppe. In lieu of flowers donations can be made to The Kidney Foundation of Canada or Canadian Diabetes Association on behalf of Enrico Mansueti. To send flowers in memory of Enrico Mansueti, please visit our Heartfelt Sympathies Store. We encourage you to share your most beloved memories of Enrico here, so that the family and other loved ones can always see it. You can upload cherished photographs, or share your favorite stories, and can even comment on those shared by others. Provide comfort for the family of Enrico Mansueti by sending flowers. Heartfelt Sympathies Store purchased flowers for the family of Enrico Mansueti.